Front is launching a major revamp today. And it starts with a brand new design. Front is now powered by React for the web and desktop app, which should make it easier to add new features down the road. Front hasn’t pivoted to become something else. At heart, it remains a multiplayer email client. You can share generic email addresses with your coworkers, such as sales@yourcompany or jobs@yourcompany. You can then assign emails, comment before replying and integrate your CRM with your email threads. But the company is also adding a bunch of new features. The most interesting one is the ability to start a thread with your team without having to send an email first. If a client sends you an email, you can comment on the thread and mention your coworkers just like on a Facebook post. Many companies already use emails for internal communications. So they started using Front to talk to their coworkers. Before today, you had to send an original email and then people could comment on it. Now, you can just create a post by giving it a title and jumping to the comment section. It’s much more straightforward. In other words, a Slack message feels like a virtual tap on the shoulder. You have to interrupt what you’re doing to take a minute and answer. Front can be used for asynchronous conversations and things that don’t need an immediate response. That’s why you can now also send Slack messages to Front so that you can deal with them in Front. With this update, Front is making sharing more granular. Front isn’t just about shared addresses. You can assign your personal emails to a coworker — this is much more efficient than forwarding an email. Now, you can easily see who can read and interact with an email thread at the top of the email view. If somebody sends an email to Sarah and Sam, they’ll both have a copy of this email in their personal inboxes. If Sarah and Sam start commenting and @-mentioning people, Front will now merge the threads. 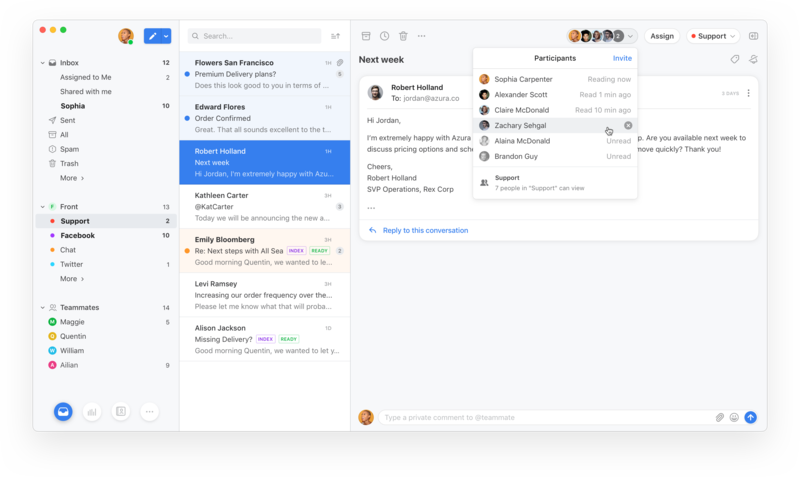 As a user, you get a unified inbox with all your personal emails, emails that were assigned to you and messages assigned to your team inbox. Finally, Front has improved its smart filtering system. You can now create more flexible rules. For instance, if an email matches some or all criteria, Front can assign an email to a team or a person, send an automated reply, trigger another rule and more. The new version of Front will be available later this month. Once again, Front remains focused on its core mission — making work conversations more efficient and more flexible. The company doesn’t try to reinvent the wheel and still relies heavily on emails. Many people (myself included) say that email is too often a waste of time. Dealing with emails doesn’t necessarily mean getting work done. Front wants to remove all the pains of this messaging protocol so that you can focus on the content of the messages.